Some of the prominent participants in the global insulated water bottles market are Ice Shaker, Thermos, Geysa, Fnova, 321 Strong, Mira healthy Human, Hydro Flask, and Cayman Fitness. In order to up their ante against their rivals, they are seen testing new and more effective materials. They are also banking upon more innovative and effective production technologies. 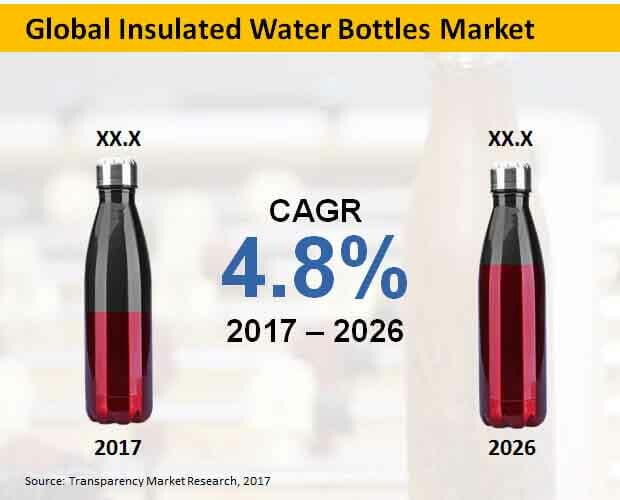 A report by Transparency Market Research finds that the global insulated water bottles market would expand at a 4.8% CAGR over the course of the forecast period from 2017 to 2026. At this pace, its estimated valuation is expected to reach US$4.1 bn by 2026-end. The report also predicts that by 2026-end, insulated water bottles worth almost US$1.8 bn will be sold for day-to-day usage. There are various kinds of insulated water bottles being sold in the market. Of them, the mugs are expected to be the top grosser in the near term. The TMR report expects the share of the segment to become 36.0% by end of the forecast period. From a geographical standpoint, Asia Pacific except Japan has emerged as an attractive insulated water bottles market on the back of India and China. This is because the cheap and abundant labor and land in the two nations make them ideal for large-scale and cost effective production. Raw materials are also quite cheap in the two regions. Changing needs of people when it comes to drinking water has been a major growth driver of the insulated water bottles market. On the advice of doctors or physicians, they are seen increasingly consuming warm fluids or water. Hence, the need to carry water or fluids of requisite temperature. The insulated water bottles market is also being fuelled by continued thrust of manufacturers to build more cutting-edge products. This has led to the emergence of smart bottles that use sensors to intimate the users of a temperature change, proper consumption amount, and other things. Newer materials are also being used by manufacture the bottles. Further players are experimenting with the size and shape of products in the global insulated water bottles market. Among other trends shaping the market dynamics are the widespread usage of insulated water bottles are high usage of plastic as raw materials. Demand for bottles made from stainless steel and metals is expected to fall over the course of the next few years. Most of such bottles are being bought by consumers for everyday usage. Currently, the online ecommerce platforms are registering high sales in the insulated water bottles market and going forward, their shares in overall sales would increase further, predict our in-house experts.